The villa is a joy! The main entrance is decorated with original & beautiful Arabic style wall tiles and an interior fountain. The villa comfortably fits up to 8 people. The gardens contain, a lawn area, many fruit trees including olive groves, palms and flowers, and both the gardens and the pool are maintained weekly by a professional pool man and gardener. Located on a hillside 10 minutes drive outside Seville city centre, the villa is surrounded by olive groves and a protected area which affords unspoilt views over the city. 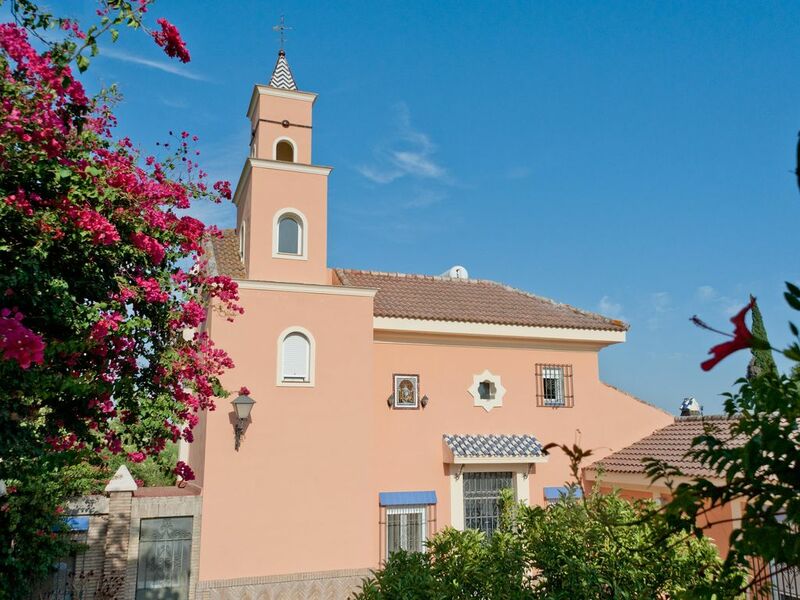 The villa and swimming pool are private and not overlooked but only 5 minutes walk from a traditional Spanish village called Valencina de la Concepcion and a local supermarket where you will be able to buy all the provisions you need. The village has numerous restaurants and bars serving traditional Spanish food and wines at very good price. We would recommend having a car which is ideal and can be rented easily at the airport or in Seville. There is a bus stop in the village which links to Seville town centre and we can also provide you with a number for a local taxi service which will be able to pick you up from the villa. The housekeeper, Loli, who looks after the villa will be on site to receive you and give you all the necessary information on your first and last day. The property is located just outside a safe and friendly village called Valencina de la Concepcion with has typical Spanish restaurants and tapas bars. There are regular buses from Valencina to Seville everyday. There is also a local taxis that we can recommend. Chimney / Fire place living room / portable heating / AC with hot air for living room. An additional charge of 40 euros/per week are charged extra when staying more than one week for extra cleaning for you during your stay. Also the housekeeper will wait max 30 min as a courtesy on your arrival agreed time. Extra waiting time will be charged at 20 euros/per hour. The agreed time needs to be agreed at least 3 days before the arrival. Please plan your travels in advance. If nothing is said check in is 4 PM. Please throw the rubbish out on a daily basis, this can be deposit in the green bin at the start of the sandy road. Please leave the house tidy up as much as you can before leaving, turn all the appliances lights and ACs OFF and if you are leaving at a different time that the agreed check in / check out please inform the host in advance min 24 h.
This is my family home with lovely memories with friends and family for years. The villa is newly renovated and is in a beautiful and peaceful setting. I would like guest to feel at home, take care of the villa with love and enjoy their stay. Ideal place to enjoy with family to relax. We provide shampoo, gel and hair dryer. The villa is located on a hillside surrounded by olive groves in a protected archaeological area which affords unspoilt views. Wie had a great time in Vista Sevilla, great location for visiting Sevilla, Cordoba and Cadiz. The house was clean, service was good thanks to Paula and Loli. Nice big garden and a lot of privacy. My wife and I spent 6 nights here. We were greeted by Loli who showed us through the house. The property is large with a pool and gardens.- plenty of space to spread out and relax. The house is very comfortable, very clean and cool even in the hot temperatures while we were there. It is about 15 minutes by car to the heart of Seville and cheap public parking make the commute a very easy one. The beauty is that in the evening you can retreat to this oasis after a day's sightseeing in bustling Seville. This is a fantastic alternative to a city based hotel room - so much more relaxing, more spacious and just more fun. Paula could not have been more helpful. Great to hear you had a wonderful time and enjoyed the villa. You are welcome back anytime. A vila which is not set up for the whole year rental. We went for Christmas and New Year and the house was very cold. No heating , just wood to burn in the fireplace!!! What a pain! The load for electricity was also not sufficient so you could not operate the toaster at the same time as the dishwasher or the washing machine. The property is quite far from Sevilla and under a bunch of huge satellite dishes. We stayed at the villa for 6 nights in May. The villa is on a large plot of land in a quiet rural area with only a few other houses. From the patio you can see views over to Seville in the distance (about 15/20 mins drive away) and the local olive groves. Whilst we did feel that the villa was in the middle of the countryside, the Carrefour Express was only a 10 minute walk away in the local village. There are also a few restaurants in the village, and a bus stop that can take you into Seville. The pictures of the villa are accurate and the property is very clean. We were met by Loli the housekeeper who was lovely and couldn't have made us feel more welcome, she was a phone call away if needed. Paula was also very helpful. The kitchen is well kitted out with everything we needed, with lots of glasses, plates etc available. We stocked up on food etc. in the large Carrefour approx 10 mins drive away. We really enjoyed our stay in the villa and would stay again if we wanted a property outside of the hustle and bustle of Seville. Thank you Mel for your kind words. We are really happy you had a great time in Villa Vista Sevilla and hope yo see you soon. You and your family are always welcome. n all seasons the villa is a joy! We kindly ask you to take special care of our villa. • Arrive at the agreed check in time and if there is any delay charges may apply and please call me. • Make sure the gate is locked at all times – both when you are inside and outside the house. • Keep your keys safe at all times and make sure all doors and windows are locked when you leave the property. • Make sure the fireplace is out when you leave and all appliances and Air Conditionings are off. • NO Smoking. • NO Pets. • No Parties.